Queso fresco is home to me. Warm tortillas a sprinkle of the queso fresco, add a pinch of salt, and I am a happy girl. I’ve been eating this for as long as I can remember. It is home like I said, back to Sacramento in my Mamas kitchen, or even back to Mexico in my aunts kitchen. Take a tortilla and warm it up over the gas stove flame, toast the edges a bit, there is nothing like it. And the salt brings a nice touch to the party of greatness happening in your mouth. Sometimes I would over salt in excitement but it is still worth it. Sitting here writing this post makes me feel sad and happy at the same time. I want to/need to go to Mexico to see my other home country, breathe the air, feel the life, and eat this snack. But of course the happiness comes from the memories and the snack itself, what it represents to me. I am so fortunate to have had the life I have and had. I grew up in Sacramento, but my summers were spent in Mexico, talk about amazing. These foods are the reminders of a life that I knew. I need that now. I tell this to Brian frequently. I miss it so bad. Seriously, I need to go to Mexico as soon as the madness of school ends. A graduation gift somehow to ourselves for the hard work we are doing. I am not sure how, but we will go, play, eat, and relish in the world I love and still know as my home in my heart. 1. Place the milk and buttermilk in a heavy bottom pot, or a dutch oven over medium heat. I used my dutch oven. Bring the milk to 90 degrees, turn off the heat, cover, and let it sit for 3 hours. Get a plate, pyrex, or bowl and 1 tsp of salt ready to go. 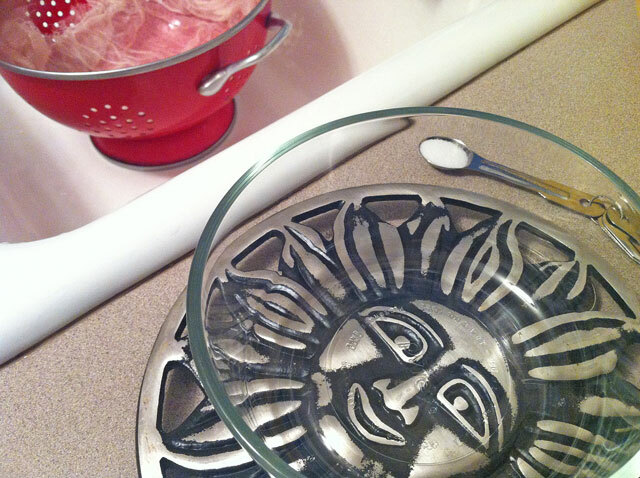 Take your cheese cloth and place it over a colander in the sink. 2. After three hours, remove the lid, stir in the lime. Place a thermometer in the pot, and bring the milk to 195 degrees over medium heat. Stir gently every few minutes. 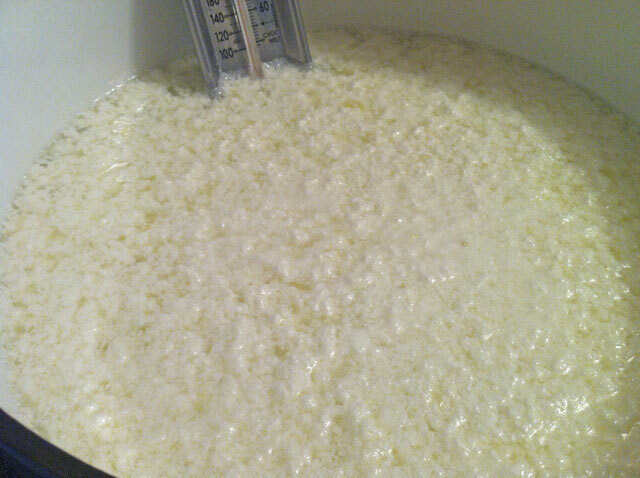 You will see the progression of the cheese curdling immediately when you put the lime juice in the milk. Keep stirring gently every few minutes. 3. Once the milk/cheese reaches 195 degrees, turn the heat off and let it sit for 2 minutes. Strain in sink over the cheese cloth. Take the ends of the cheese cloth, and wring out the excess water. Place the cheese on the plate or in the pryrex/bowl, add the salt, and mix in using a fork. 4. Pack the cheese together firmly using you hands and form a disk. Place covered in the fridge for 2 hours, or for up to a week. Just make sure it is covered tightly, because fresh cheese tends to absorb flavors from the food around it. I sprinkled this on my enchiladas that night. But I also use it in my tacos, on salads, on crackers or crusty bread with olives and tomatoes, or on a warm tortilla. The possibilities are endless. 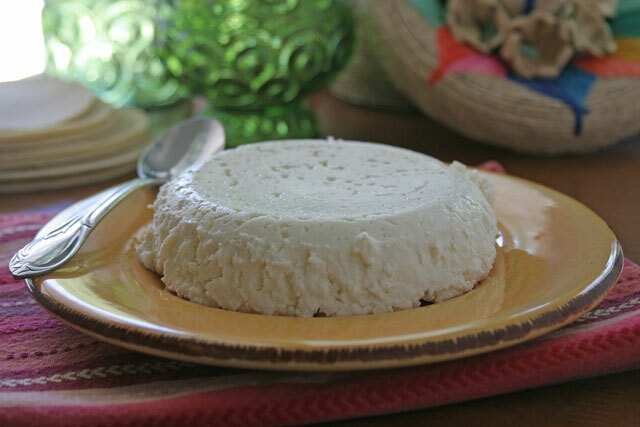 Nice, never thought of making my own queso fresco though I have made paneer– looks easy! I’m imagining that is 1/4 cup of lime juice? Yes, thank you for letting me know. I fixed it! 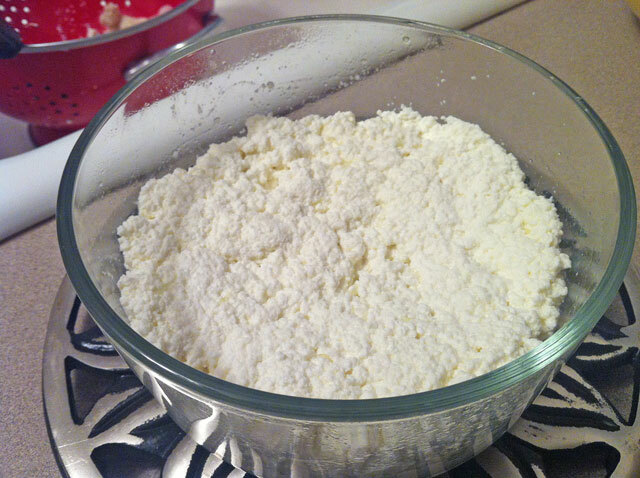 I love queso fresco…thanks for showing us how to make it!! Isn’t is so good?!!! So my pleasure, I hope you make it soon, it is super easy! I’ve made paneer and ricotta, but never queso fresco–and why? This looks really easy! Thanks for the great idea!